Watch Friday, November 9 at 9 p.m. on CBC-TV (Canada). Bob McKeown reports on the controversy over what to do with older elephants when they are ready to retire. Or you can watch the show online after it airs by clicking this link. An exciting update from In Defense of Animals. If you appreciate the work they do, you can click through to the link to give a donation. A five-year-long taxpayer lawsuit against the Los Angeles Zoo and its controversial $42 million elephant exhibit was decided Tuesday in favor of the plaintiffs. California Superior Court Judge John L. Segal released a scathing decision that called zoo officials “delusional.” He concluded that the elephants are not “healthy, happy or thriving.” The judge said the zoo’s new exhibit is injuring the three elephants who live there, Billy, Tina and Jewel, but stopped short of closing it. Instead, he ordered the zoo to make changes such as increasing exercise and rototilling to soften the soil in the exhibit, and banning bullhooks and electric shock devices. The judge wrote: “The evidence at trial shows that life at the Los Angeles Zoo for Billy, Tina, and Jewel is empty, purposeless, boring, and occasionally painful. Their lives are supervised, managed, and controlled by zoo employees who appear to be in the dark about normal and abnormal behavior of elephants, in denial about the physical and emotional difficulties of the elephants they manage and whose lives they control, and under the misconception that the elephants prefer to live their lives in an exhibit with human companions rather than with other elephants.” Click here to read more, including what you can do to help. The Los Angeles City Council today unanimously declared Aug. 3 Elephant Awareness Day in the city to increase awareness of the often poor conditions that pachyderms experience in captivity. The council also recognized Pacific Palisades resident Juliette West, a 16-year-old activist against elephant cruelty. “Throughout history, elephants have played an important role in human economies, religion and culture, and they are beloved animals that attract crowds to zoos and circuses and many attractions,” said Councilman Tony Cardenas, who sponsored the resolution to increase awareness about the often poor treatment of elephants in captivity. “Many people are unaware, though, of the inhumane abuses that these creatures suffer when they are held in captivity,” he said. Cardenas said elephants are often squeezed into “dangerously small spaces, causing them mental and physical harm” and rarely survive to their average expected life-span in the wild. Click here to read the full article for more great quotes from the L.A. City Council about elephants in captivity. The Association of Zoos and Aquariums (AZA) has stripped the Toronto Zoo of their accreditation for allowing their three elephants to be retired to PAWS in California, a vast sanctuary in an elephant-friendly climate. The AZA said the Toronto Zoo contravened it’s governance rules when the Toronto City Council and Toronto Zoo Board, rather than Zoo officials, voted for the humane retirement of their elephants to a sanctuary instead of to another zoo. The AZA, in flexing its muscles, is trying to send a message to other zoos about retiring their elephants to a life that is undeniably physically and psychologically healthier. This decision reflects poorly upon the AZA by their putting ego before the improved welfare of the elephants in their care. Bamboo, Chai and Watoto, the three elephants at Woodland Park Zoo, desperately need to be retired to one of the two elephant sanctuaries. Only there can they heal from the traumas of the 16-17 hour lock up in a tiny barn stall for over half the year, access to less than one acre outdoors, and the lack of companionship of their choosing. Friends of Woodland Park Zoo Elephants asks the Seattle City Council and Woodland Park Zoological Society not to be bullied by the AZA. It is long overdue for them to show the same courage and compassion—based on science—as Toronto and retire Bamboo, Chai and Watoto to a sanctuary. For more information about this unfortunate AZA behavior, check out the True Colors article in Psychology Today. Ringling Bros. Circus is applying to the U.S. Fish and Wildlife Service to renew their breeding registration for Asian elephants. They have repeatedly demonstrated that elephants should not be in their care—the largest fine in animal welfare history was levied against them. Public comments are extremely important and influence the U.S. Fish and Wildlife Service. Being in a circus is pure hell for these gentle giants. E-mail text: Please deny Ringling’s application to renew its captive-bred wildlife registration (PRT-720230) for Asian elephants. The Reid Zoo in Tucson, AZ plans to transfer their two elephants – Connie and Shaba – to the San Diego Zoo where sadly these two friends of 30 years will be separated from one another. The PAWS Sanctuary has offered to take in these two ladies at their sanctuary instead where they’d get to live out the remainder of their lives together and with dignity. Please contact officials in Tucson and urge them to surrender Connie and Shaba to PAWS rather than send them to a zoo where they’ll be separated. Celebrated television personality and animal-welfare activist Bob Barker is going to “come on down” for Connie and Shaba so that Tucson’s beloved elephants can remain together—but will the City Council join him? On a recommendation from the Association of Zoos and Aquariums, both the Reid Park Zoo and San Diego Zoo have refused to find a way to keep them together—and believe us, we’ve asked. Aside from those zoos, no other accredited facility that houses African and Asian elephants together is remotely suitable for Connie and Shaba due to a small exhibit size, the use of bull hooks or requirements that elephants give rides and perform circus tricks. This speaks strongly to their so-called “rigorous” standards. Forced to reach beyond that system, we approached PAWS (the Performing Animal Welfare Society), which has agreed to provide sanctuary for Connie and Shaba—together—when no one else has. Connie and Shaba have been together at the Reid Park Zoo in Tucson for 29 years—Connie was 15 and Shaba was just 2. They have been deeply bonded since the day they were first brought together. Tearing Connie and Shaba apart is unconscionable. A fundamental requirement in elephants is being a bonded member of a social group. Anyone who knows anything about elephants knows this, yet the Tucson City Council succumbed to Reid Park Zoo and voted to separate them. Please help these elephants by filling out IDA’s form: Click here. It’s fast and so important. The Toronto Zoo board has directed its staff to prepare to transfer the city’s three aging elephants to PAWS sanctuary in California by April 30, 2012. This endorses the Toronto City Council’s decision to send the elephants. Unfortunately, the elephant keepers are still resisting what’s best for the elephants by not allowing Ed Stewart from PAWS to see the elephants. Hopefully the elephant keepers will sign on to this compassionate move so that PAWS can work with the elephants on training for their transport. Ground-breaking initiative on animal circuses announced on Capitol Hill. Tarra’s little dog Bella has died. 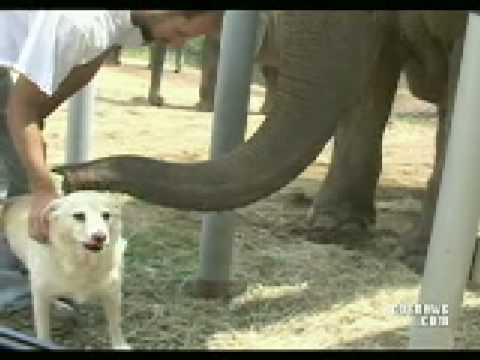 We hope Tarra will take comfort in the love of her elephant friends. Here is a video which made the unlikely couple famous! The most probable scenario is that during the night Bella strayed from Tarra briefly and was set upon. Tarra arrived too late to save her but was able to stop further damage being done to Bella’s body. With deep sadness and deeper wonder we come to comprehend what likely happened next—that Tarra picked Bella up and carried her home.